When we published Panzer Grenadier: Eastern Front many years ago, I was really proud of the effort that went into it. One hundred and twelve scenarios, from all parts of the Eastern Front, stretching from the initial Axis attack in June 1941 into early 1942. I’m still satisfied with my work on that game, but it’s not the sort of game I want to publish anymore. I’ve come to see a somewhat different way of approaching game design, in which the game still has many scenarios, but they’re used as narrative building blocks to tell the story of a war or campaign. For a while now, I’ve wanted to publish a Panzer Grenadier game on the massive tank battles that took place around Brody and Dubno in western Ukraine in the first days of the Axis invasion of the Soviet Union. And I’ve also wanted to get new versions of the maps from the old Eastern Front back into print, with brand-new artwork, so long-time players of Panzer Grenadier could play the scenarios from the many supplements we’ve published over the years without needing to find the old out-of-print game. When we found large stocks of playing pieces for the old Eastern Front still in our warehouse, opportunity beckoned. Fire in the Steppe (the title’s a callback to Henryk Sienkiewicz’s magnificent Polish Trilogy) uses those playing pieces, plus all-new versions of the original Eastern Front maps (the woods and hills and rivers are in the same places, but the artwork is completely new) in a new game based on the Brody-Dubno tank battles of June and July 1941. There are 42 scenarios, all of them brand-new (a couple of the same actions got a scenario in Eastern Front, but the scenarios are new). Since the release of Eastern Front’ve assembled far better sources for those battles, particularly from the Soviet point of view. This was a huge tank battle, by some measures larger than that at Kursk waged two years later, and it definitely deserves its own treatment in Panzer Grenadier. If we’re going to call it a “historical wargame,” then it needs to be based on history. Besides, I have to justify those pretentious letters after my name up there in the byline. And there’s plenty of good history in the Brody-Dubno tank battles. The German 1st Panzer Group, led by Ewald von Kleist, had five panzer divisions to give it armored striking power plus four motorized infantry divisions (two of these latter were Waffen SS formations of dubious fighting qualities). All told the Germans had about 800 armored fighting vehicles (tanks, assault guns and tank destroyers). The Soviets, for their part, had six tank corps in the battle area, though most of them were woefully unprepared for modern mechanized warfare. These units possessed a little more than five times as many tanks as the Germans, but this number included many stationary training vehicles and other inoperable machines. Mikhail Kirponos, commander of the Soviet South-Western Front, had done his best to prepare for the expected attack despite orders from Moscow to avoid provoking the Germans and a fanatic commissar at his side determined to see those disastrous directives carried out to the letter. Kirponos’ troops had been alerted hours before the attack and begun to move into their fighting positions. Unlike the situation on other sections of the front, when the Germans came Kirponos’ troops fought back. As with Broken Axis, the scenarios are divided into sections, with the historical narrative woven between them and a “battle game” for each section that ties them together in game terms. The battle games, a concept added to Panzer Grenadier by series developers Matt Ward and Daniel Rouleau, are a pretty simple but extremely effective means to link the scenarios without masses of bookkeeping and/or special rules. These let you play a sequence of scenarios with an eye toward the campaign’s overall operational goals, so some scenarios and victory conditions are more important than others, and you can also “win” more of the scenarios without necessarily achieving your operational goals (that means you won the battles but lost the war, so to speak). Panzer Grenadier’s Fourth Edition rules suit the Brody-Dubno battles very well; many of them are encounter battles (each side enters from one edge of the map and then slugs it out more or less in the middle) and the reconnaissance rules get to come into play. The Soviets often have good numbers and the troops are more than willing to fight (the divisions, caught without their reservists, have a mix of new recruits and long-service cadre on hand). Many of their tanks are older, less-capable models like the T-26 and BT-7, but there are new T-34 and KV-1 tanks available to several of the tank divisions. The Soviet 34th Tank Division also has the massive T-35 “land battleship” - the only combat unit in the Red Army so equipped. The problem comes in command and control, an area that really shows off the strengths of the Panzer Grenadier game system. German panzer formations have many more leaders than equivalent Red Army units, and much better initiative. It’s a subtle distinction, wrapped up in two tiny lines in the scenario setup instructions, but it has an enormous impact on game play. The Soviets have firepower, often more than the Germans, but can’t easily bring it to bear. But it’s an advantage that requires care on the part of the German player: grow careless, and that bear will swat you hard. On cardboard, the Soviet tank park is pretty impressive: the T-35 land battleship is a rolling heap of weaknesses, but the T-34/76 is a well-balanced machine that totally outclasses anything in German gray. The KV-1 is much slower, with the same armament and better protection. But most of the Soviet tanks are the old light models: the fast BT-7 and the slow T-26, which actually have better firepower than many German tanks but paper-thin armor (a problem shared by many German tanks as well). Soviet tanks do not have inherent leaders like those of the Germans, and they lack “armor efficiency” – in game terms, they don’t shoot as often and it’s harder to move them toward the enemy. 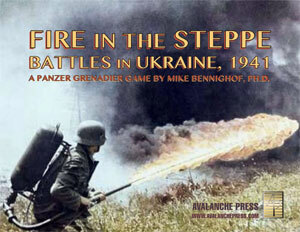 Fire in the Steppe is intended as a statement of what the Panzer Grenadier game system can be. If you’re interested enough to have read this far, you’re going to like this game.